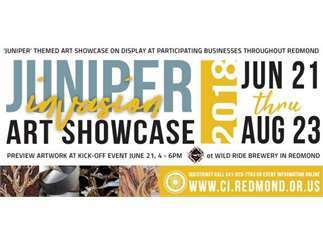 Juniper tree themed art showcase at Wild Ride Brewing in Redmond. Twenty one art pieces will be revealed. Be the first to see all pieces at one location. Artists will be on hand to answer questions. Art pieces range from pastels to sculptures. After the reveal event, the art pieces will be displayed throughout the Redmond community until August 22, 2018 and then sold at the Juniper Tree Invasion auction on August 23, 2018 Centennial Park Plaza in Redmond.